Rashes can appear on the skin for a variety of reasons including friction, allergies, infection, skin disease and others. If a rash appears all over the body immediately following an outbreak of fever then it is important to take this quite seriously. Exanthematous or roseola infantum, also known as the three day fever can cause this large body rash to occur. Children between the ages of 6 months to two years are particularly susceptible to this condition and will need to be watched carefully when fever occurs. Fever. Roseola infantum will typically begin with a fever that can increase over 103 degrees F for 3-5 days. This is typically accompanied by swollen lymph nodes or a cough. A runny nose or a slightly sore throat may be present just before the fever begins. Rash. In most cases a rash that appears in patches or pink spots will appear across the body. In most cases this will start near the chest, abdomen and back and spread to the limbs, though it may not appear on the face or legs. These areas may be raised and can have a white ring around them, but generally are uniform and flat. The rash may last for as little as a few hours but can appear for several days before it fades completely. During this time the rash should not be uncomfortable or itchy. Others. Additional symptoms of roseola include mild diarrhea, fatigue, runny nose, irritability, decreased appetite and swollen eyelids. In some cases the rapid increase in body temperature can cause a child to experience a seizure. This can result in the temporary loss of bladder control, jerking of the limbs and head or loss of consciousness for a few minutes. These seizures are rare, and those that experience them often have short episodes that are not harmful. However, any child that experiences a seizure should be treated to emergency care to ensure their safety. Most often, herpes virus 6 or human herpes virus 7 lead to roseola symptoms. This virus will spread through contact with an infected individual’s saliva. 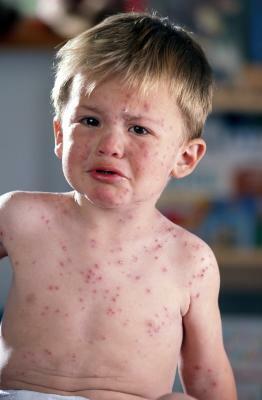 You can contract this condition even if the person you came in contact with does not have a rash. Roseola rarely causes a communitywide outbreak, but if your child was recently interacting with another that is known to have this condition you should watch them closely to check for symptoms. Infants have the greatest risk of developing this condition as they lack the necessary antibodies to fight off most viral infections. Babies receive the antibodies necessary to fight off such conditions while in the womb, but this protection fades over time as the child has been born. Most who contract roseola are between 6-15 months. Those that are immune compromised are also at a greater risk for developing roseola. These individuals are also at a higher risk of a case of fever rash returning because they have less resistance to viruses. Immune compromised individuals are more likely to experience a severe reaction or have complications stemming from roseola that could be life threatening or damaging to the brain. It is difficult to diagnose roseola because it shares symptoms with a variety of childhood diseases. If your child is not showing signs of a cold, strep throat or ear infection but is exhibiting a high fever, watch for the rash commonly associated with roseola to appear. A blood test can also be used to note the antibodies associated with this disease. Most children recover from this infection within a week but you can use over the counter medications such as ibuprofen or acetaminophen to help bring down the fever. Only do this after speaking to your doctor and take caution when using medications such as aspirin as a fever reducer. Giving aspirin to underage patients can cause flu or chickenpox-like symptoms that are linked to Reye’s syndrome in children. In some cases ganciclovir, an antiviral medication, will be given to those with a compromised immune system to help prevent serious complications of roseola. Rest. Children should rest until their fever subsides to avoid straining. Fluids. Your child should sip clear fluids such as clear sodas, water, broth, sports drinks or electrolyte solutions to prevent dehydration. If you provide your child with a beverage that is typically carbonated, shake it or stir it until the carbonation has subsided to reduce the risk of discomfort due to burping excessive intestinal gas. Sponge Baths. Placing a cool washcloth on your child’s head or giving them a lukewarm sponge bath can help to ease the discomfort of roseola. Do not use fans, cold water or ice to cool your child as this may cause chills. There is no vaccine for the viruses that cause resola. Keeping infected children away from others and avoiding contact with those that have the infection is the best way to prevent spreading it. Anyone living with someone that has roseola should wash their hands frequently to avoid spreading the virus throughout the household. Children typically develop the necessary antibodies to avoid the infection by the time they enter school. If you have a compromised immune system and recently came into contact with someone suffering from roseola you should speak to your doctor immediately. These individuals are increasingly susceptible to an infection that will be more severe. Any child who has a seizure brought on by fever symptoms or is suffering from fever spikes should be treated with emergency medical care. They should also be taken to a doctor if the rash has not improved after 3 days, the roseola fever symptoms have lasted more than 7 days or their fever is over 103 degrees F.